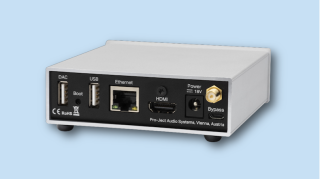 Pro-Ject Stream Box S2 Ultra network-enables DACs with USB inputs | What Hi-Fi? The network streamer supports Tidal, Spotify Connect, Shoutcast internet radio, DLNA and Roon. For anyone with a ‘dumb’ hi-fi system (not connected to the internet) who wants to stream music from a NAS drive or streaming service, your best bet is to invest in a streamer. But if your DAC (or pre- or integrated amplifier with DAC) has a USB input, Pro-Ject could have just the streaming device for you. The Stream Box S2 Ultra (£599) connects to your network via wi-fi or ethernet, and then to a DAC via its ‘audio-optimised’ USB type-A output. This gives users access to their NAS drive over DLNA, Tidal, Spotify Connect and internet radio – all controllable via the app or over a web browser. It’s also Roon Ready, so subscribers to the music player software can send files from it to the Pro-Ject. Essentially, the Stream Box S2 Ultra acts as a network bridge, sending files directly to your DAC. If you have MQA files, for example, there shouldn’t be any incompatibility issues. There are also two USB inputs onboard for connecting external hard drives, and a HDMI video output for hooking up a monitor to display the Stream Box S2 Ultra’s graphic user interface.